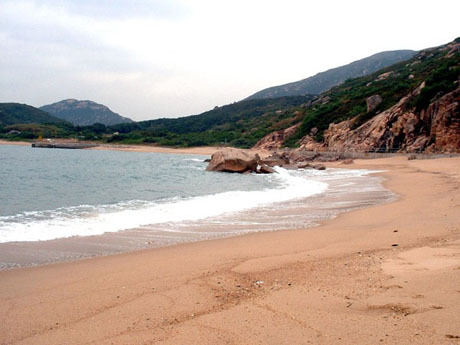 Lantau’s southern coastline has some fine sandy beaches of which Cheung Sha is the longest and most popular. The beaches here are just off the South Lantau Road, framed by scenic hills and peaks and the rushing waves of the South China Sea and are fairly narrow strips of fine sand stretching for about 1500 metres long and divided into the upper beach and lower beach. Immediately beyond is a third good beach at Tong Fuk. 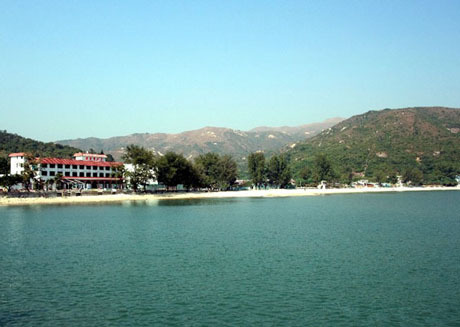 CHEUNG SHA LOWER BEACH is located close to Cheung Sha Village and has changing rooms, showers and toilets. There are beachside restaurants including The Long Island and The Beach House. *The Stoep with South Africa inspired menu, once located right on the beach, relocated about 100-metres inland in early 2016. *The Stoep restaurant was permanently closed in June 2017. The owners have since opened a new restaurant "Stoep at High Tide" at Riverwalk building in Mui Wo. There is a watersports resort, Long Coast Seaports where sailing, sea kayaking, windsurfing, wake boarding, skimboarding, surfing & bobyboarding are on offer as well as accommodation in guest rooms or well equipped Safari tents. Lifeguard service operates from April to October. The beach has shark prevention nets. The Stoep, popular restaurant, once located on the beachside, relocated a short distance inland in early 2016 but has since closed (see above). CHEUNG SHA UPPER BEACH being more exposed to winds is considered one of Hong Kong’s best windsurfing beaches and is well equipped with showers, changing rooms, toilets, snacks kiosk and BBQ area. There are also pavilions where visitors can find shade and rest. However the facilities here were badly damaged during Typhoon Hagupit in September 2008 and major repair work has been undertaken to the access steps, path and other facilities. Tonnes of sand was washed away during the typhoon and between July and September 2009 and temporary barriers have been put in place perpendicular to the waterline to prevent further erosion of sand until a study to provide a permanent solution has been completed. Lifeguard service operates from April to October. This beach also has shark prevention nets. 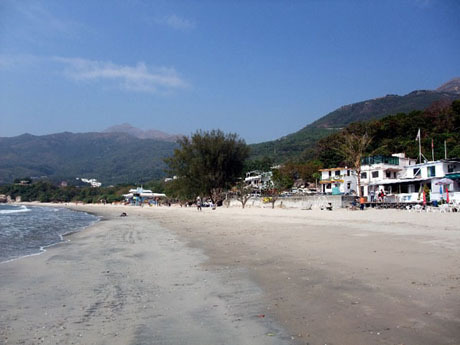 TONG FUK BEACH just beyond Cheung Sha Upper Beach is not as scenic but is also a popular beach with changing rooms, showers and toilets and there are also private holiday flats for rent and a barbecue restaurant and village shops. The beach is protected by shark protection nets. Lifeguard service operates from April to October. GETTING THERE – From Mui Wo Ferry Pier Bus Terminus buses 1, 2, 4 and A35 all travel along South Lantau Road and stop at Lower Cheung Sha Beach, Upper Cheung Sha Beach and Tong Fuk Beach. The stops for Lower Cheung Sha Beach are the second and third stops after the roundabout at the junction of South Lantau Road and the new section of Tung Chung Road (which opened February 2009) at San Shek Wan. Journey time from Mui Wo to Lower Cheung Sha Beach is about 20 minutes. Stops for the other beaches are a little further on. Bus 3M from Mui Wo also serves South Lantau Road but turns off at the junction with the new Tung Chung Road at San Shek Wan. 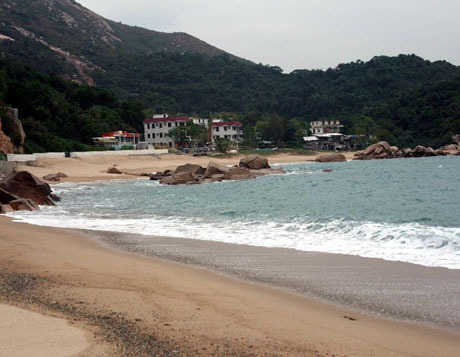 Lower Cheung Sha Beach is about 15 minutes walk from San Shek Wan along South Lantau Road. From Ngong Ping bus 2 passes all three beaches. From Tai O buses 1 and 11 passes all three beaches. Set in very scenic surroundings at the foot of the Lantau hills about 5 minutes walk from Mui Wo ferry pier this sheltered beach is not quite as good as the beaches along the south Lantau coast but has decent sands, pebbly in places and good facilities with changing rooms, showers, toilets, BBQ area and beach volleyball court. 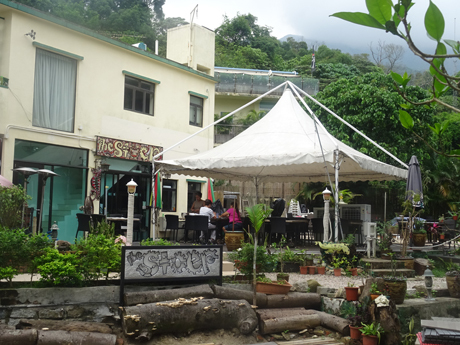 There are two beachside hotels, the 128 room Silvermine Beach Resort (under new ownership and renamed from Silvermine Beach Hotel in September 2011) and the Mui Wo Inn and there are plenty of café’s and restaurants in the vicinity. Lifeguard service is provided from April to October. The beach has shark prevention nets. Between November 2016 and July 2018 a major renovation programme (Signature Project Scheme Islands District) was undertaken of beach facilities including new BBQ sites, public toilets, showers and changing facilities, refreshment kiosk, construction of a viewing platform and rebuilt promenade from the ferry pier and alongside the beach. GETTING THERE – Ferry from Central Pier 6 on Hong Kong Island (30/50 mins) to Mui Wo or from Tung Chung bus 3M (about 60 mins), from Ngong Ping bus 2 (about 50 mins), from Tai O bus 1 (about 45 mins). Discovery Bay is a private residential development with European-style luxury apartments, shopping plaza, numerous café’s and restaurants, marina and golf course. The excellent sheltered tree-lined artificial beach at Tai Pak Bay, next to the ferry pier, with its wide strip of fine sand is open for visitors to use and does not often get crowded. The beach is popular for water sports. GETTING THERE – Ferry from Central Pier 3 on Hong Kong Island (25 mins) or from Tung Chung bus DB01R (10 mins), Sunny Bay MTR Station bus DB03R (10 mins) or from Hong Kong International Airport bus DB02R (20 mins). 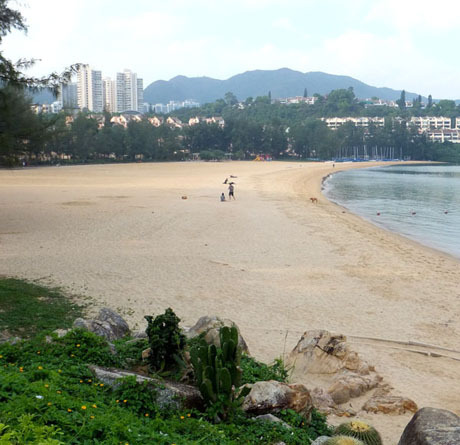 Tung Wan (East Bay) Beach is a popular beach with fine sand but isn’t one of the most attractive beaches in the Outlying Islands. The beach is overlooked by the Warwick Hotel at one end and cheap holiday rental apartments at the other. Structures at the northern end of the beach were badly damaged during Typhoon Hagupit in September 2008 and this end of the beach remained closed at January 2009. The beach has changing rooms, showers, toilets, raft and shark prevention net. There are numerous restaurants and café’s in the vicinity. Lifeguard service operates from April to October. GETTING THERE – Ferry from Central Pier 5 to Cheung Chau. From Cheung Chau Ferry Pier just beyond Circle K convenience store follow Tung Wan Road (not the street along the harbourside) across the narrow central part of the island to Tung Wan Beach (about 5 minutes walk). 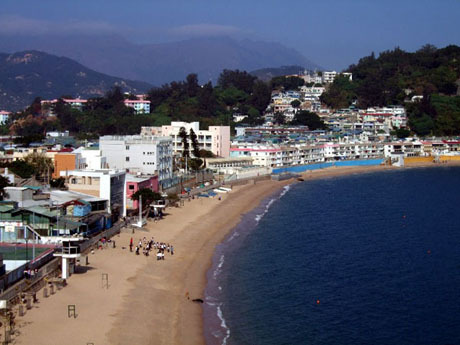 Situated in the bay adjacent to Tung Wan Beach (see above) just beyond the Warwick Hotel and helicopter landing pad Kwun Yan Wan Beach is home of Cheung Chau Water Sports Centre which produced Hong Kong’s only Olympic gold medal winner Lee Lai-shan in the 1996 windsurfing event in Atlanta. 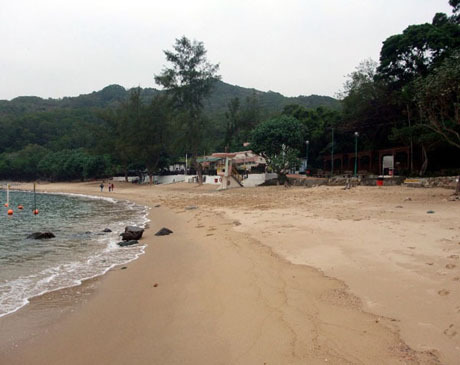 This beach is smaller and usually quieter than Tung Wan Beach and is more secluded and sheltered. Facilities include changing rooms, showers, toilets, raft and a café at the windsurfing centre. Lifeguard service is provided from April to October. The beach has shark prevention nets. 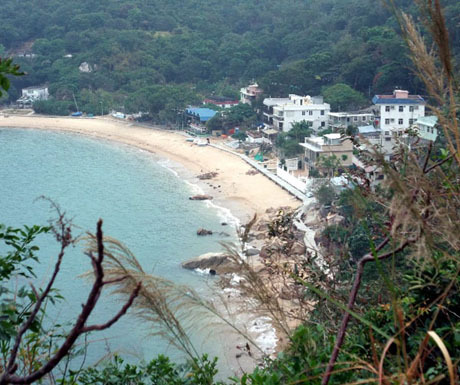 GETTING THERE – Follow instructions above for Tung Wan Beach. Kwun Yam Wan Beach is immediately beyond the Warwick Hotel and helicopter landing pad (about 2 minutes walk from the southern end of Tung Wan Beach). This remote beach located in a sheltered cove on the south-west corner of the island is rarely visited by tourists and is usually completely deserted. 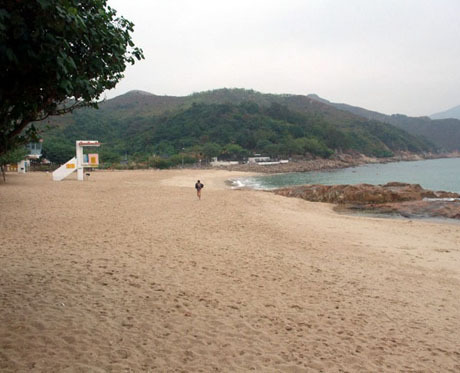 The beach lies on the route of a trail between the pirate’s cave at Cheung Po Tsai to Peak Road West via the Reclining Rock headland and is overlooked by tall grasses and trees. The secluded beach has coarse sand and is suitable for swimming although care needs to be taken to avoid hidden rocks. There are no facilities here or lifeguard service and there is no shark prevention net. GETTING THERE – From Cheung Chau Ferry Pier follow the harbourside path past Cheung Chau Public Pier, restaurants and the market and keep following the harbourside along Cheung Chau Sai Tai Road to Sai Wan where there is a small harbour and pier. Just before reaching Sai Wan pier follow the path from the harbour uphill through the CARE Village. This leads to Peak Road West which is part of the family trail. Keep following Peak Road West until reaching a path on the right just before the cemetery which is signed for Pak Tso Wan. The beach is a short distance along this path. It takes about 40 minutes to walk to the beach from the ferry pier. From Sai Wan the beach can also be reached by footpath around the rocky coastal headland where Cheung Po Tsai Cave is situated but this does involve scrambling over rocks and a certain amount of agility. As an alternative to walking to Sai Wan there is a kaido ferry service from Cheung Chau Public Pier to Sai Wan. This operates frequently on Sundays and public holidays but less frequently (more or less according to demand) on weekdays. Also known as "Power Station Beach", Hung Shing Yeh Beach on the western side of the island is the most popular beach on Lamma and is about 25 minutes walk from the ferry pier at Yung Shue Wan. 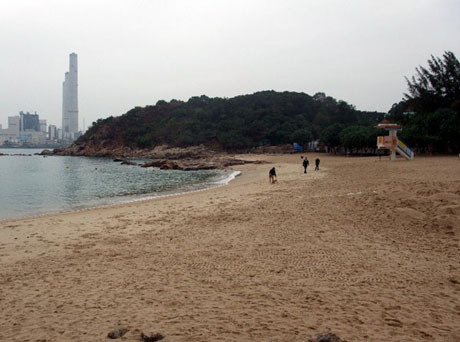 The beach has excellent sands and facilities but is somewhat spoiled by views of the nearby Lamma Power Station. Facilities include changing rooms, showers, toilets and BBQ area. At the beachside stands the Concerto Inn, a small hotel and restaurant and Cavia café which serves drinks and snacks. The beach has a lifeguard service from April to October and is protected by shark prevention net. GETTING THERE – Ferry to Yung Shue Wan from Central Pier 4 on Hong Kong Island. From Yung Shue Wan ferry pier follow the path through the village and at a “Shell Gas” sign take the path on the left signed for “Sok Kwu Wan” which is the main path across the island. Follow this path beyond the village outskirts and shortly after passing the Lamma Police Post the path descends to Hung Shing Yeh Beach (about 25 minutes walk). Alternatively take ferry from Central Pier 4 to Sok Kwu Wan and follow the path through the seafood restaurants and continue across the island towards Yung Shue Wan. It takes about 50 minutes to reach Hung Sing Yeh Beach. Lo So Shing is an attractive tree-lined beach in a sheltered cove just a little further along the west coast from Hung Sing Yeh Beach. Although Lamma Power Station is visible in the distance it is fairly inconspicuous. The beach has excellent sands and facilities including changing rooms, showers, toilets, raft and a solar powered floodlit BBQ area on a rocky outcrop at the southern end of the beach. There is no café but there are drinks vending machines. There is a lifeguard service from April to October and the beach has a shark prevention net. GETTING THERE – See above for instructions for getting to Hung Shue Yeh Beach. From Hung Shue Yeh Beach continue along the path across the island towards Sok Kwu Wan. On reaching Lo So Sing Village continue ahead through the village (do not take the path on the left signed Sok Kwu Wan which passes Lo So Shop). After passing the village the path descends through tall vegetation and then ascends before reaching a path on the right by a public toilet. This path leads down to Lo So Shing Beach. It takes about 30 minutes to walk to Lo So Shing Beach from Hung Shue Yeh Beach. The beach can also be approached from Sok Kwu Wan by following the path through the seafood restaurants through the village and across the island. Shortly after crossing mudflats and Cave Kamikaze on the outskirts of Sok Kwu Wan the path divides. Continue along the path past the disused Lo So Sing School (do not take the harbour side path) and before reaching Lo So Shing Village the path to Lo So Shing Village is on the left (about 25 minutes walk from Sok Kwu Wan Ferry Pier). Mo Tat Wan is located east of Sok Kwu Wan and has a small quiet sandy beach overlooking the Lamma Channel which is one of the main shipping lanes for vessels entering and leaving Hong Kong. The bay is overlooked by a wooded hillside. Although the location of this beach is a little off the beaten track there is a western restaurant The Bay located right on the beach. There is a ferry pier and toilets but no other facilities and no lifeguard service or shark prevention net. GETTING THERE – Ferry from Central Pier 4 (Hong Kong Island) to Sok Kwu Wan. From Sok Kwu Wan Pier follow the family trail away from the village past the playground/sports ground (do not follow the path through the seafood restaurants). The path continues along the coast then turns inland before reaching Mo Tat New Village. At the entrance to Mo Tat New Village follow the path down to Mo Tat Wan Beach and pier via steep steps. In a remote sheltered bay overlooked by Ling Kok Shan on the south-east coast the sandy rocky beach at Shek Pai Wan stretches between two small partially abandoned villages Yung Shue Ha and Tung O along the Lamma Family Trail. The sands here are coarse and the remote location means the beach is usually deserted but this is a quiet restful spot to relax. There is a pier and public toilet but no other facilities and no lifeguard service. GETTING THERE – Ferry from Central Pier 4 (Hong Kong Island) to Sok Kwu Wan. From Sok Kwu Wan Pier follow the family trail away from the village past the playground/sports ground (do not follow the path through the seafood restaurants). The path continues along the coast then turns inland to pass through Mo Tat Village before reaching Yung Shue Ha at the northern end of the beach. Tung O Village is at the southern end of the beach. From Sok Kwu Wan pier it takes about 40 minutes to walk to Yung Shue Ha. To return to Sok Kwu Wan continues along the trail which leads back to the Tin Hau Temple on the outskirts of the village via a circular route (about 40 minutes). Alternatively take the kaito ferry from Aberdeen to Mo Tat Wan (see above) and from Mo Tat Wan pier take the steps from the beach which lead to the family trail and follow the trail to Yung Shue Ha (about 25 mins). A beach with a difference! Tung Wan Beach is located on an island right under one of the worlds longest suspension bridges, the Tsing Ma Bridge which forms part of the Lantau Link, and is alongside a theme park with full size replica Noah’s Ark. 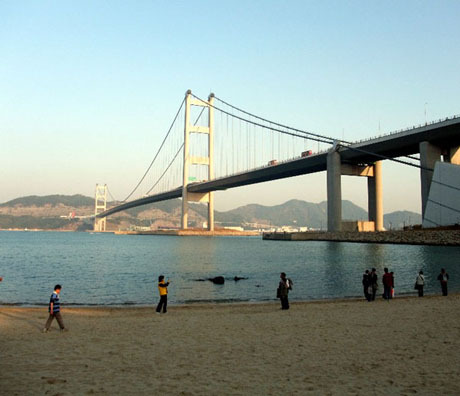 The beach is a flat stretch of fine golden sands alongside the Park Island private residential development and whilst its location might not suit everybody it provides a superb views of the both the Tsing Ma Bridge and Ting Kau Bridge and shipping which will please photographers. At the bridge end of the beach is the Noah’s Ark development which opened to the public in March 2009 and includes full-size animal replicas, museum, hotel and restaurants. It forms part of the Ma Wan Park “green” theme park project which is partially open and includes themed gardens, adventure journey, windmill station, playground, heritage centre, learning centre and hilltop lookout with excellent views of the Kap Shui Mun Bridge. This was originally planned to be a major theme park but was scaled down following the arrival of nearby Hong Kong Disneyland. The beach has changing rooms, showers and toilets and there are restaurants and café’s nearby on Pak Lai Road behind the beach and in the piazza by the ferry pier. The beach has lifeguard service from April to October and has shark prevention net. GETTING THERE – Ferry from Central Ferry Pier 2 (Hong Kong Island) to Park Island (25 mins). The ferry service from Tsuen Wan Ferry Pier to Park Island was discontinued from 14th December 2012 but a limited ferry service between Park Island Pier and Tsuen Wan Pier resumed on 8th June 2013 with three daily sailings each way at 11-15, 13-15 and 15-15 from Park Island and 11-45, 13-45 and 15-45 from Tsuen Wan. 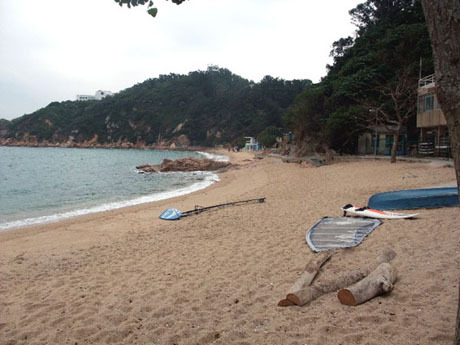 Tung Wan Beach is about 8 minutes walk from the ferry pier. Bus - Park Island Transportation Services NR330 from Tsing Yi MTR Station (24 hour shuttle service), NR331 from Tsuen Wan (Sai Lau Kok Road) (circular shuttle service 6am to 11-40pm), NR332 from Kwai Fong Metroplaza (24 hour shuttle service), NR334 from Hong Kong International Airport (circular service 6am to 11pm daily). Previous taxi restrictions on access to Ma Wan were removed on 14th December 2012 and urban (red) taxis can now travel to and from Ma Wan 24 hours a day.